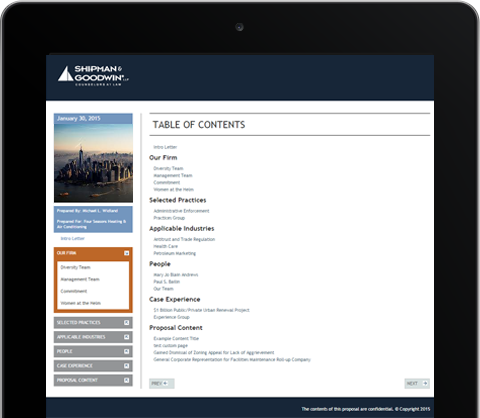 First developed in 2001, the award-winning Saturno EPC is recognized as the first web-integrated proposal system for law firms. Today Saturno EPC introduces the latest and most innovative features to enable entire organizations to manage, create, and track proposals in a single environment. The intuitive browser-based system is as easy to use as a common website, yet provides users with sophisticated and powerful tools to find information and create proposals and pitches in minutes. Most people are creating proposals minutes after trying it for the first time. Saturno Experience and Proposal Center enables everyone throughout your firm to easily create new proposal or find previously created proposals. Deploy the system to be used by people throughout your firm, or control access to EPC by limiting access to a specific set of users. DOC, HTML, PPT, PDF - Saturno Experience and Proposal Center allows you to work with multiple file formats. EPC includes a powerful search engine to find the information you need quickly. Search for specific types of content like bios or practice areas. Search for experience (matters & transactions) using a detailed search tool, or simply search all content by typing a keyword or search phrase. Publish and manage content for use only in proposals, or integrate with WebBack for publishing online, in proposals, or both. Collect matter and transaction information from attorneys and others in your firm, review/edit, and publish this experience information for use in proposals. 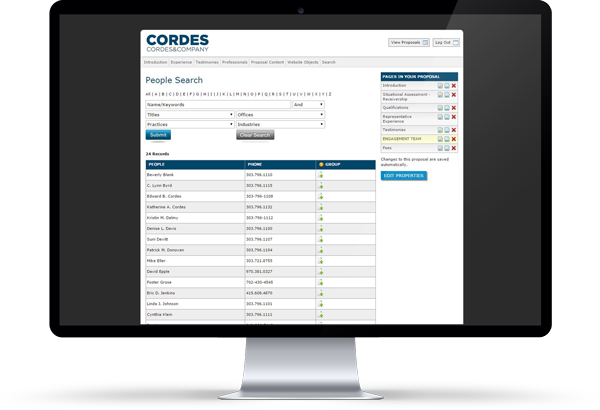 Relational data-management allows you to browse and manage experience by practice, industry, attorney, or to conduct powerful targeted searches by all available criteria. EPC tracks win/loss for all of your proposals, and provides reporting tools that you can customize and save. 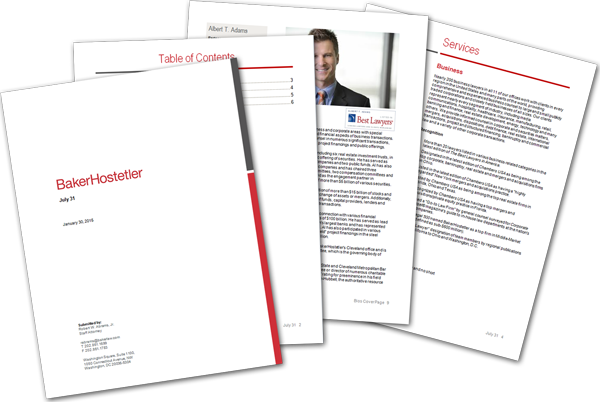 Produce well-formatted, easy-to-understand reports for review, export to MS Word, or print. PowerPoint proposals are simple with EPC. Automate the creation of PowerPoint slides, or load your own PP slides. Browse or search for slides and pick and choose by practice, industry, attorneys, or custom collections you create. EPC enables the use of different versions of proposal templates. This enables firms to choose the document layout or style they want to use for their document, or establish template rules for different offices, practice groups, etc. EPC has been used by firms to deliver secure, web-based proposals since 2001. Proposals can be published as password-protected mini-websites, delivered instantly to clients and prospects. Accurate, well-formatted MS Word document output is a must. Saturno EPC offers the most sophisticated components to turn your content into usable MS Word documents. Our advanced methods for .DOC creation eliminate formatting problems common in proposal automation. EPC enables firms to store and use multiple versions of biographies in proposals and pitches. Keep practice, location, and other specific targeted biographies available for inclusion in any document or online. EPC uses the same fast, reliable, and easy-to-use components and tools as our popular WebBack content management system – for fast screen load times and quick search. EPC enables users to save a proposal to be used as a template for building new proposals. Each template can include any number, combination, and order of content. Your team can use and reuse these templates time and time again as a starting point for creating practice or industry specific proposals. There are three licensing options available for Saturno EPC to accommodate the needs of large, medium, and small firms alike. EPC integrates seamlessly with our other marketing software systems, including WebBack, Email Marketing Center, and all of our other products. EPC can also be integrated with a variety of third party software systems such as CRM systems like Microsoft Dynamics, Interaction, ContactEase, Salsforce, and others. EPC supports content in multiple languages and character sets.